South Gallia’s Jacob Birtcher (12) battles Wahama’s Bryton Grate (3) for possession of a reception during Friday night’s Tri-Valley Conference Hocking Division football game in Mercerville, Ohio. MERCERVILLE, Ohio — Kyle Northup may have had most of the rushes, but Christian Thomas certainly had most of the points. 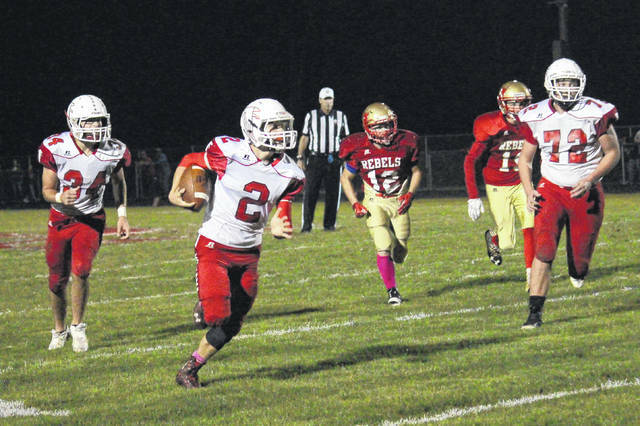 That’s because Thomas, the Wahama senior running back, tallied all six touchdowns for the visiting White Falcons — and amassed a massive 242 yards on 15 carries in the White Falcons’ 41-6 Tri-Valley Conference Hocking Division football victory at South Gallia on Friday night. In fact, Thomas easily outrushed the Rebels by himself — 242-177 — as he scored 36 of the White Falcons’ 41 points. On defense, Thomas turned the tide of the contest with an interception and 28-yard return to set up Wahama’s second score, as he also shared for a team-high nine tackles. In the first quarter, his three touchdown runs of one, three and two yards — exactly nine minutes apart — put Wahama in front 21-0. In the second half, he only touched the ball three times — as Wahama ran just eight plays from scrimmage. However, he definitely made all three carries count, scampering for scoring sprints of 42, 82 and 60 yards to make it 41-6 with just four minutes and 44 seconds remaining. By half, Thomas toted 58 yards on a dozen attempts, then erupted for 184 yards and his second hat trick of scores. But, Thomas was not what Wahama coach Dave Barr considered a one-man wrecking crew. The White Falcons rushed for two yards shy of an even 400 on 36 carries, and the defense forced two turnovers and made two second-half stands inside the 3-yard line. With the win, Wahama won its second consecutive tilt to raise its record to 3-5 — and to 3-4 in the TVC Hocking. The White Falcons are now 15-2 all-time against the Rebels, as those two defeats were the last two meetings before Friday. It is also the first time in which the Mason Countians have captured back-to-back road wins in three years. Needless to say, but the improving White Falcons simply dominated the line of scrimmage, as youthful South Gallia — still minus the injured two-way standout Jeffrey Sheets —fielded just 22 players. And, a lot of them were already banged up going in —and likely even more were dinged up coming out. 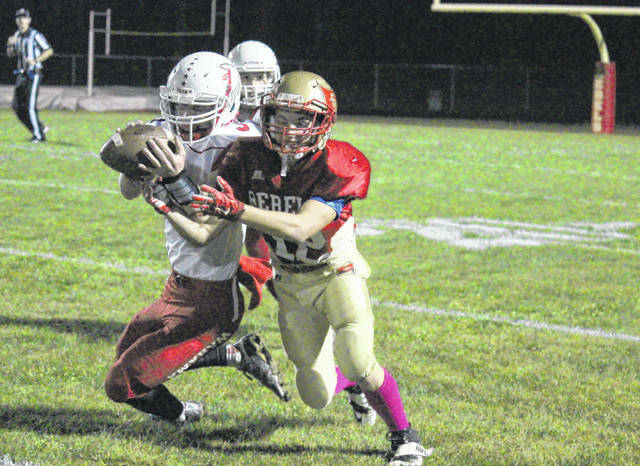 The loss, which was South Gallia’s fourth straight, dropped the Rebels to 2-6 — and to 1-5 in the league. In all six setbacks, the Rebels have allowed at least 40 points per game. The work done by the White Falcons, however, was impressive. They punted only once — a 27-yard boot that followed a three-and-out possession to open the fourth quarter. Aside from that series, Thomas scored on two one-play drives in the third period — his 42-yard dart just 56 seconds into the quarter and his 82-yard jaunt with 5:50 remaining in the stanza to make it 34-0. His 60-yard dash occurred on the third play of the White Falcons’ final possession, as Brady Bumgarner added the extra point to make it 41-6. In the first quarter, Thomas completed touchdown drives of five plays and 58 yards, seven plays and 40 yards, and finally four plays and 36 yards. The first score came just a minute and 45 seconds in, when — after gains of nine and 11 by Bumgarner and 23 and 11 by Colton Arrington on the opening series — Thomas took the fifth carry and crossed from a yard out. On the second drive, Coltyn Hendrick took a jet sweep 23 yards to the Rebel 6-yard line, where Thomas —with five carries already in the series —scored from three yards out at the 4:51 mark. Johnnie Board then ran in the two-point conversion, making it 14-0. Then, after South Gallia initially crossed into Wahama territory, Thomas helped himself with an interception of Jaxin Mabe —returning the ball to the Rebels’ 36. After Arrington opened the next possession with a 28-yard run, Thomas closed it with a 2-yard plunge, taking the direct snap from center and scoring with 1:17 to play. Christopher Hesson, who also added the extra-point kick following the opening TD of the second half, hit his first PAT to make it 21-0. Arrington added 78 yards on only seven attempts, while Bumgarner gained 55 yards on 13 totes. Bryton Grate completed two of his five pass attempts, as both went to Hendrick for 29 yards. For the Rebels, the freshman Northup notched a hefty 40 carries for 174 yards, with 29 touches and 114 yards coming in the second half. His three-yard run on 4th-and-goal with 6:10 to play finally got the Red and Gold on the board, capping a six-play, 18-yard drive that was started by a 17-yard punt return from midfield and a Wahama personal-foul penalty. Northup had all but nine of South Gallia’s carries —as the Rebels ran 53 plays from scrimmage, including 34 in the second half which operated under the Ohio High School Athletic Association’s running-clock rule for the final 17 minutes and 50 seconds. Wahama held the Rebels to 67 total yards in the first half, including 63 on the ground, as Northup had 11 carries for 60. Mabe completed his only pass on four attempts, which went to Austin Stapleton for four yards. “Our defense, especially our front four and our inside linebackers, really played well tonight too,” said Barr. The Rebels’ lines, on the other hand, did not. South Gallia, after drives of 10 and eight plays in the third quarter to right near the goal line and a nine-play four-and-a-half minute march on the final drive of the game, failed to produce points. That followed three three-and-out possessions in the first half, as the Rebels punted twice for an average of 25 yards, as their first attempt actually resulted in a bad snap and run of only three. Trailing 21-0, the Rebels took the second-half kickoff, but a fumble on the second snap gave the ball back to the White Falcons. The Rebels return home, and return to TVC Hocking Division action, next Friday night against Southern. Wahama will do the same against Miller, which Barr believes is a de facto playoff game for his club.